Red Spruce Press, 9780692874707, 220pp. For fifty years, world-class poets have come to the village library in Katonah, New York to read for the Katonah Poetry Series. For close to 25 of those years, Billy Collins has curated the series. Psychologist and poet Andrew Kuhn interviewed 21 of these poets before their readings, asking probing questions about craft and the creative process. The poets themselves expressed surprise and appreciation for where these conversations went. 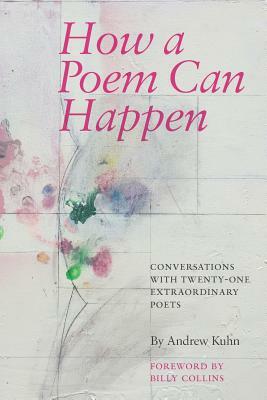 These unique exchanges are now collected in How a Poem Can Happen: Conversations With Twenty-One Extraordinary Poets. With a foreword by Billy Collins. "Andy Kuhn's questions become conversations that, one by one, deeply engage and enlighten. With major poets so forthright about their craft, you'll wish you were in the room. At the very least keep How a Poem Can Happen close at hand. It's simply a gem of a book." "While asking (and answering) questions about process, influences and the writerly life may seem easy, it's really about letting the conversation go toward the unexpected, the uncharted. These interviews give us insight into one of the most difficult jobs to describe: the poetic mind and its workings. And Kuhn has just the right touch--after reading, we readers receive "the poet" as an even more human, and humane, artist." These poets include three Poet Laureates of the United States--Billy Collins, Robert Pinsky, Kay Ryan--and many other distinguished authors of multiple award-winning collections, like Paul Muldoon, Alan Shapiro, Ellen Bass. (See the full list below).